I think a lot of us have a bad relationship with email. Be honest, how many times have you spent all day in email, feeling productive, only to realize later that you haven’t accomplished anything meaningful? I know I have. We compulsively check and manage our email, wasting valuable time on things that don’t matter. Today’s typical professional spends nearly 30% of working hours in email. Considering that we send and receive hundreds of emails per day, this fact isn’t all that surprising to me. The issue, however, is that the majority of messages we receive are not important. In fact, SaneBox’s data shows that just 38% of emails are important enough to be filtered into the inbox. That means the other 62% are mere distractions, unfairly eating up precious moments of our day. To make matters worse, the number of emails we receive is expected to grow each year for the foreseeable future. As online communication continues to grow, so will your problem with email. For years it has been shown that people who are distracted by incoming emails and phone calls experience as much as a 10-point decrease in IQ plus elevated stress levels. So while it seems harmless enough to jump into our inbox each time we see a new message, this habitual multitasking is actually killing our productivity by as much as 40%. And for what? To delete an unimportant message or be interrupted by a colleague’s request that can wait? When you spend all of this time managing email and then refocusing on what you were doing, what are you not getting done? This is exactly how and why we can spend a day feeling busy, only to later realize that our to-do list is just as long as it was this morning. SaneBox’s email management tool works in your email to ensure you see only the emails that are important now; that’s the 38% we discussed earlier. Just the act of temporarily blocking interruptions from the other 62% of incoming messages saves the average user 2 to 3 hours per week. That’s the equivalent of 20 eight-hour work days each year. Think of what you could do with all of that time. 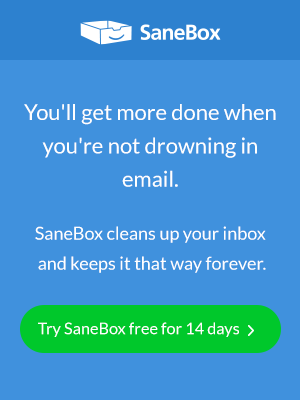 If you’re ready to reclaim your email productivity, head over to www.sanebox.com to try it free for two weeks.